But charedi-leumi can often veer strongly towards charedi, especially with regard to the faculty. And there are times when the kids learn stuff that is so anti-rationalist that it makes me want to tear my hair out. Taking extreme Midrashim literally, learning stories with the most fanciful interpretations, explaining them in an entirely ahistorical way, and so on. I once posted a memorable picture that one of my kids brought home from gan, of Rabbi Adam in the Garden of Eden. Then there was the striking zoological error in a picture of a ram that another of my kids brought home. A primitive bovine of some sort! A woolly mammoth! A spear-bearing and club-wielding caveman! My daughter told me that these people "lived a very long time ago," and that she had seen an accompanying video which explained how they lived. I was doubly flabbergasted when she told me that this was a project that she had done in "archeology class." In England, archeology classes are something that you take in university, not in first grade! This is terrific. I have found that the way that most people react to conflicts between Torah and science has very little to do with the actual content of the topic, and much more to do with their emotional comfort. 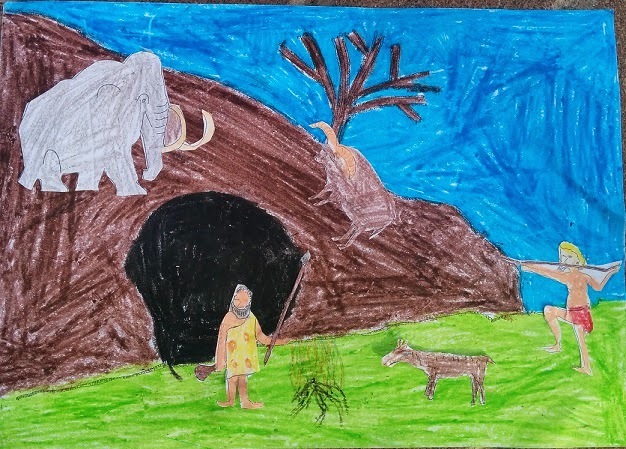 Hopefully my daughter's project means that if she ever encounters the topic of human prehistory later in life, instead of feeling threatened and insecure, it will bring back happy memories of elementary school. Yabadabadoo! Great post. I can tell you wrote it with a smile on your face, as I had when reading it. And I identify with everything you wrote. PS, I also liked the title of your previous post. Good headlines deserve credit. First, it's "Yabba, dabba, doo!" Secondly, don't get so excited. Nothing in the Torah says the first few generations of people after Adam didn't look live in caves and wear Flintstone-inspired outfits. And the wooly mammoth? Clearly they didn't make it onto the ark, that's all. And thankfully there were no pictures of dinosaurs together with the humans! I once had occassion to visit a classroom of an ultra-conservative Haredi elementary school and I saw a picture book about the story of Yosef. It had pictures showing Pharoah looking like a medieval king with a European-style crown and the two servants of Pharoah in prison were dressed like Russian peasants. Now, I can understand some generations ago, back in the old country in Eastern Europe drawing such pictures for the kids of that era, because that is all they knew. However, for modern Haredi kids here in Israel, that world of old Europe is just as remote as ancient Egypt is to them, so why not draw Pharoah and ancient Egyptians dressed the way we now know they did, based on the discoveries of ancient Egyptian culture that were made already 200 years ago? In other words, fairy tale characters wear pointy crowns, not ones with snakes. The crowns in LOTR are pretty unique, and not at all European as we usually imagine them. Hmm. Is it possible that it was deliberate? Something to do with a prohibition of studying and depicting things Egyptian? You are so right. I haven't read much of Dawkins' work, but I've read enough to understand that in the world view that I think he represents, once you've shown scientific explanations for the world, you've disproven religion. Just this morning, starting a book called "The Bonobo and the Atheist," by Frans De Wall, I encountered the following statement: "For those who believe that morality comes straight from God the creator, acceptance of evolution would open a moral abyss." (You could just as easily substitute "dinasors" or prehistoric man for evolution - the issue is the same.) My immediate question: Why?! My answer: Because too many rabbis, ministers, and priests have insisted upon denying scientific facts that would otherwise cause them to question their simplistic readings and understandings of scripture. This religious fundamentalist denial of science is what has set up a presumption that isn't at all logical, namely, that finding scientific explanations of the world somehow disproves God's existence. As if the existence of a world that runs according to ordered rules of physics and genetic codes that can produce the evolution of man and almost infinite variteties of life from microscopic creatures is somehow inconsistent with a divine plan and a divine wisdom running the world, as you so thoroughly describe in the first chapter of "The Challenge of Creation." Evolution doesn't disprove God, but it takes most of the force out of the Cosmological Argument, which is the argument most people use to justify their belief in God. The morality argument is a red herring. Morality has nothing to do with belief in God one way or the other. From whence would you derive morality, pray tell? Evolved instincts and social norms. Altruism is a virtue because groups of people that were altruistic outperformed groups that weren't. Killing members of your group is immoral because groups in which people killed each other were outperformed by groups in which people didn't kill each other. And so on. Evolved instincts, social norms, outperformance, etc., have nothing to do with absolute morality. There is nothing to say that your version of morality is superior to anyone else's. Besides, some groups or individuals may very well decide that they can best survive by killing you. Animals do it all the time. Is killing members outside your group moral, then? Secular materialists have never been able to answer this question, and they never will. If you believe God and the Torah, why would you even want to go down this road? You've been reading too much Dawkins, my friend . . . I don't think there is such a thing as absolute morality. And if there is, then God has nothing to do with it, as Plato pointed out in the Euthyphro Dilemma. > Besides, some groups or individuals may very well decide that they can best survive by killing you. Sure. That's why we have laws, to make sure that even those who might be inclined to cheat are forced to adhere to the social contract. > Is killing members outside your group moral, then? Apparently. AFAIK, killing a goy is only an issur baal tashchis. > If you believe God and the Torah, why would you even want to go down this road? If you don't believe in absolute morality (or "moral imperative", if you want to be Kantian), then you have no real basis through which to evaluate the morality of an action, other than how it impacts your survival. Although I'm sure you don't mean in this way, this is not that far from Nazi ideology - the superiority of more "fit" races, etc., etc. "Apparently. AFAIK, killing a goy is only an issur baal tashchis." That is absolutely false. Just because there is no death penalty punishable by Jewish courts, that doesn't mean it's not a heinous crime - for example, relatives of a ger toshav are allowed to kill his accidental (!) Jewish killer. Keep in mind that the death penalty was rarely carried out for even Jewish murder victims. You can Google the topic for countless other sources/examples. Besides, according to your philosophy, you shouldn't have a problem with that "halacha"! I suspect your "answers" in fact reveal your questions - that's why you visit this site! Y. Ben-David, that's nothing. I once came across a charedi kid's biography of R' Yonasan Eibeshitz that tells the story about how he got an anti-semitic bully arrested. The cops drag him off to a police station adorned with the logo of the Israeli Police. Of course, Israel is a very important center for early human stories- there are lots of Neanderthal and early modern human remains here, and evidence is that this was an important location in the history of the two and their interactions with each other. You mean that Avraham Avinu didn't where a streimel (as one of my kids once brought home in a notebook)?! Would he have gone outside without at least a yarmulke on his head?! Probably listened to Avrohom Fried tapes too, because those have *definitely* been around for as long as anyone can remember... :) Don't know about the validity of the head covering-religion link, but I'm too tired and intellectually lazy to research it. Hard to see how drawing pictures of woolly mammoth in the1st grade will help to reduce confusion about its very existence later on in life. Strange post. "That's one small step for charedi-leumi, one giant ???? for charedim." Here how a confusion may play out in child's mind: Woolly mammoths are so cute! I love them! Abba, can u buy me a toy woolly mammoth for my afikomen, please? Abba, how come there no more woolly mammoths anymore? Why did Hashem create them and then let them all die? A smart kid will have all this and the absence from the Noah's Ark figured out about 2-3rd grade. What will the teacher explain to the classroom? Let's pretend I'm a 2nd grader, tell it to me. 3. Species of animals go extinct, it's part of nature, due to many factors. 'cause it will not jive with the creation narrative that the rebbe/morah is teaching. And how are you going to explain it to a 2nd grader? What's the problem? What's wrong with a story that goes, God created animals, those animals may change over time (nishtane hatevah, right? ), and some species go extinct. What is Chareidi about the Chareidi-Leumi school that you send to, and why does that appeal to you more than - say - a standard Dati Leumi school? Yes, we see pictures of them running amok through Beit Shemesh and Meah Shearim on a regular basis. There is an old apocryphal story of the kedushat levi of berdichov commissioning a chanukkah menorah with each oil lamp reprsenting the avot (and i presume others). The silversmith asked "how should i dress avraham avinu?" "With a capotah and a shtreimel!" "But we know avraham avinu didnt dress that way?" "Yes, but if he would come see us today, he will be dressed that way!" How is your daughter going to relate to the exhibit in the Bible Land's Museum which suggests that the Mishkan was a portable Egyptian temple taken along for the ride iy the Hebrews? Ahem, I was waiting for someone else to call you on the caption. While the guy guarding the cave entrance may, possibly, be a depiction of a Neantherdal. The blond, lightly built guy about to throw a spear appears to be of the Homo Sapiens family. Now, this cute and well executed picture (I choose to disregard the primitive elephantine (the unwooly 'mammoth'), and the Aurox standing on the rocky slope) could be taken as a representation of the coexistence of the different human species (or they could both be Homo Sapiens. However, since your child has not yet learned the art of perspective drawing (she has talent, however) he may be aiming his spear at the cave guardian rather than the aurox. In any case, it would be a rather extreme fundamentalist position to assume that humans did not coexist with mammoths (woooly or not) or aurochs, or that humans never lived in caves, i.e., to assume that all such excavated bones are artifacts. Hence your daughter is not yet threatened with a dichotomy betweeen your understanding of human and earth history vs. her teachers and rebbe'im. It will happen, sooner or later, i'm afraid. That would be Fred and Barney...or Peres and Baruch if you please, Mr Aharon. Barney representing H sapiens, and perhaps even using an atlatl for the spear whose point will only bounce off Fred's prominent prefrontal skull ridge. That and the blond hair, which goes back only to the start of the Holocene and not before the spread of Baltic region cereal growing cultures make the appearance of the woolly mammoth about to crash through the cave roof shockingly anachronistic. No limestone cave systems in the Baltic, but we can forgive that as youthful indiscretion. And the horns on the bovine resemble those of an Asian bison, rather than an aurochs...although that's more in R. Slifkin's department to opine on. Still, someone needs to have a stern talk with that kid.